Blakecoin (BLC) and Photon (PHO) are two crypto currencies based on the Blake 256 algorithm and there are already two pools available where you can do merged mining of the two coins. The work on adding merged mining for Blake-256 algorithm coins has been going on for some time by the developer of the Blake-256 algorithm and it seems that he has finally been able to make things work properly. Do note that the merged mining pools listed above are still in beta and there could still be some small issues, though our initial testing has shown that they are running pretty well already. Hopefully the availability of merged mining pools will boost the popularity of the Blake-256 algorithm and the coins that use it such as Blakecoin as they are indeed interesting. We now have a merged mining pools for Blake-256 based crypto coins, currently supporting merged mining of Blakecoin and Photon, but for mining these you need a special version of cgminer with support for the algorithm being used by them. The Blake-256 algorithm hashrate is about 3x faster than what you are getting from the same hardware mining for Bitcoin. So for example with a Radeon R9 280X you can expect to get a hashrate of about 2-2.5 GH/s or more when mining Blackecoin (BLC) or other Blake-256-based crypto currencies such as Photon (PHO) for example. You cannot use the standard cgminer for mining Blake-256 crypto coins, you need to use a special version of cgminer with support for this algorithm (source) and you can download the windows version of cgminer 3.7.2 for Blake-256 mining below. 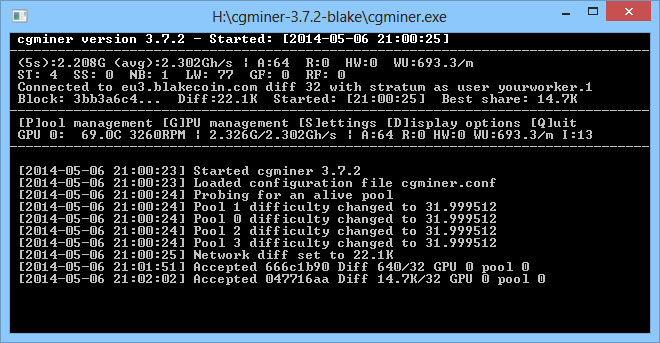 Note that this version of cgminer is compiled with support for Blake-256 mining alone, you cannot mine other coins using different algorithms with it.